Angelico Press is one of the few Catholic presses today for whose new releases one could envisage having a standing subscription and not be disappointed with each title as it comes in the mail. Even so, Angelico occasionally outdoes itself by publishing a book that soars above and beyond the normal expectations of readers, a book that (in a sense) redefines and enlarges those expectations. Such a book has just appeared: In Sinu Jesu. 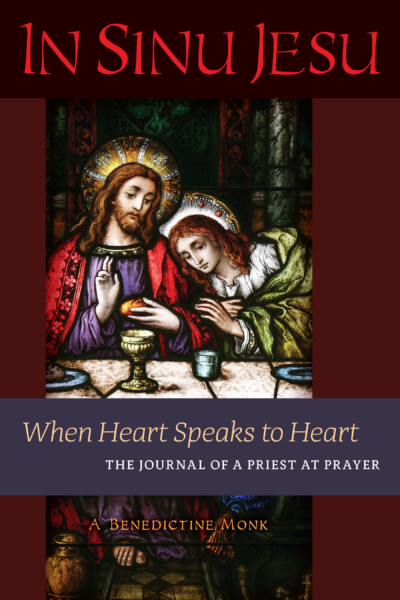 When Heart Speaks to Heart: The Journal of a Priest at Prayer. It will be difficult to describe this work of mysticism in any way that remotely does justice to the contents. Someday I hope to do a full and proper review, but for now let it suffice to say that it is a book of words received from the Lord, His Mother, and other saints during Eucharistic adoration, words which are largely about adoration (in its narrow and broader senses) but which, in keeping with this sacramental focus, also extend to the Holy Sacrifice of the Mass, the Divine Office, the ministerial priesthood, the prayer of the clergy, the religious, and the laity, and the interior and exterior dispositions necessary for seeking and attaining intimate union with God. To describe it to someone who has not yet had the privilege of reading it, I would say something like this: imagine a fusion of St. Gertrude the Great, St. Therese of Lisieux, and Bd. Columba Marmion. I don't often say this kind of thing because I prefer not to over-recommend, but given what a special message this book holds for priests in particular, I urge the clergy who read this announcement to get a copy of In Sinu Jesu and bring it for spiritual reading to Eucharistic adoration, or simply before the Blessed Sacrament reserved. Judging from the reactions of many other priests who have had the chance to read parts of the manuscript over the past several years, it is a book that can work wonders. I highly recommend it for religious and laity, too, because the message of In Sinu Jesu applies to Christians in every state of life. People should also consider giving this book as an Advent or Christmas gift to their local priest(s). Below is the announcement from the publisher's site. In 2007, Our Lord and Our Lady began to speak to the heart of a monk in the silence of adoration. He was prompted to write down what he received, and thus was born In Sinu Jesu, whose pages shine with an intense luminosity and heart-warming fervor that speak directly to the inner and outer needs of our time with a unique power to console and challenge. Given the harmony of its content with the teaching of Sacred Scripture, Catholic Tradition, and well-known works of the mystics, it is eminently fitting that In Sinu Jesu be published in full at this time (it has been granted the imprimatur). Passages from this journal have already influenced the spiritual lives of priests, religious, and laymen. May it now give light and warmth, consolation and renewed conviction, to readers throughout the world.